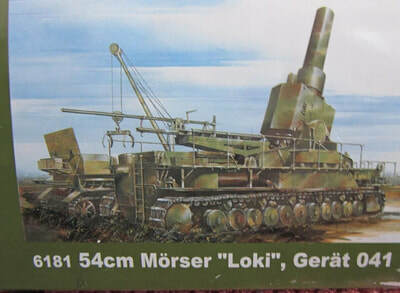 In Box Review of The DML 1/35th Scale German Railway gun "Leopold"
MSRP: $140.00 at Sprue Bros.
My kit has a copyright date of 2003. 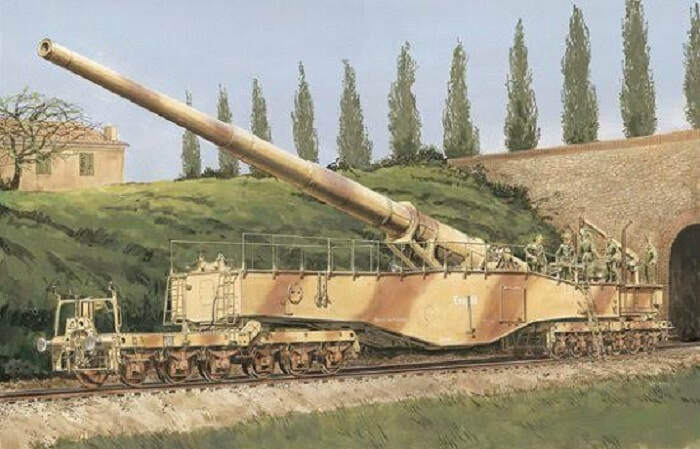 The 28cm K5(E) was probably the best workaday railway gun ever built. It formed the backbone of the German railway artillery force, in WWII, and they saw wide service. Designed at the same time as the K12, several features were changed, notably the deep-groved barrel and ribbed shells. A rocket-boosted shell was developed which increased the maximum range to 53.7 miles, although at the expense of accuracy. 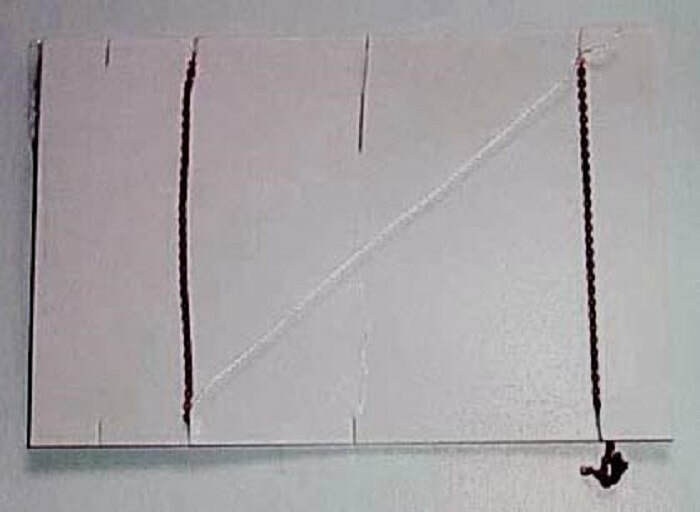 After this, a barrel was bored out to smooth-bore and a fin-stabilized shell, the Peenemunde Arrow Shell, was fired with a special propelling charge to give a maximum range of 93.5 miles. Towards the end of the war, with air attacks increasing, movement of railway guns became difficult. In 1943 a program was began for developing a new type of weapon, a railway gun which could be carried by road if necessary. This was needed to bypass bomb damaged tracks. The 28cm K5 was to be modified to have a platform beneath the center of the mounting. If held up by damaged tracks, the gun could be lowered onto the platform and the flat cars removed. Two special tractors, built from modified Tiger chassis, would move under the ends of the mounting and carry it. Thus, the whole weapon could be driven around any obstacles. If required, the gun could be taken to any position and placed in action back on its platform supports. This project was still in the planning stages when the war ended, but many of its basic features were to be seen in the American 25cm M65 gun which appeared some years later. The American nickname for one German 28cm Kanone K5(E) railway gun was "Anzio Annie" or "The Anzio Express". This gun was concealed in a railway tunnel near Colli Albani and only emerged briefly to fire a few rounds at a time before returning to it¹s lair. As a result, it was never damaged by Allied counter-battery fire or air attacks. The noise of its 563 lb. Shells, passing overhead, became a familiar sound to troops in the beach-head. Anzio Annie was blown up by the Germans, to avoid its capture. Two K5(E) guns have been preserved, one at Cap Griz Nez in France, and the other one at Aberdeen Proving Ground Museum, in Maryland U.S.A. The K5 at Aberdeen is a combination of pieces of Anzio Annie (Leopold) and a sister gun named "Robert".. These are the only WWII railway guns to have survived the war. This kit comes in a HUGE, very sturdy, generic white box (27 " x 17" x 5"). It is also a HEFTY kit, weighing in at around 10-11 lbs! The box art is a sleeve, that the white box slides into the ends of. The box art is by DML¹s resident artist Valstad, who does the majority of their armor and figure kits box arts. 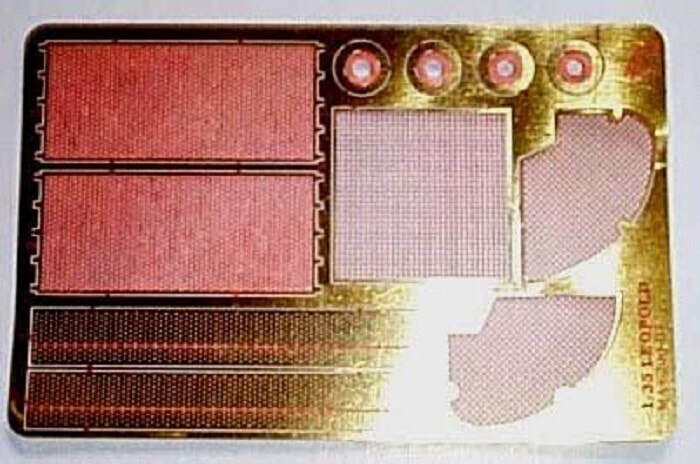 A side panel, of the cover sleeve, says that the six man gun crew and brass PE fret in the kit are a "bonus". There is also a full color rendering of the box art of a later to be DML kit release of the 54cm mortar "Loki" Great 041 (kit no. 6181). ​I recently did the "Karl" version of this vehicle and look forward to getting one of these too, when it comes out. ​The large white box is sectioned inside. 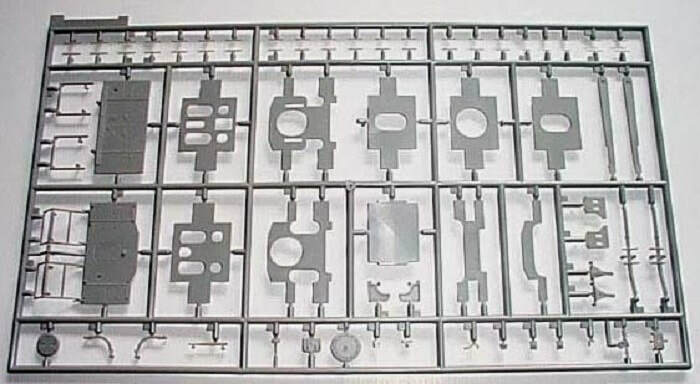 There are white cardboard compartments that separate the parts trees. ​The long part, that is the vehicle¹s chassis, is in one long compartment (the length of the box). It is held, firmly in place, with a couple of lock-down tabs. There are 31 parts trees, a brass PE fret, some metal chain, a lenth of string, the decal sheet and instructions in the kit. Most of the trees are in cello bags of their own. 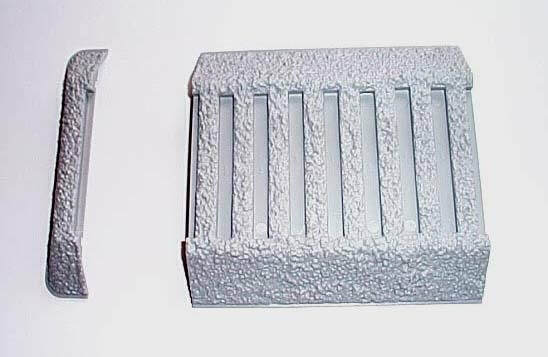 The parts are molded in DML¹s signature medium gray colored styrene. Sixteen of these trees are for the railroad bed, railroad ties, and rails. 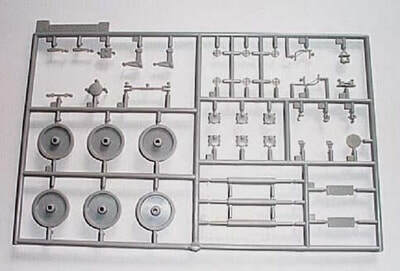 One tree of parts is the six gun crew figures. The balance of the trees are for assembly of the vehicle. The long instruction sheet (19 3/4" x 8 1/4") accordian-folds out into 8 pages. 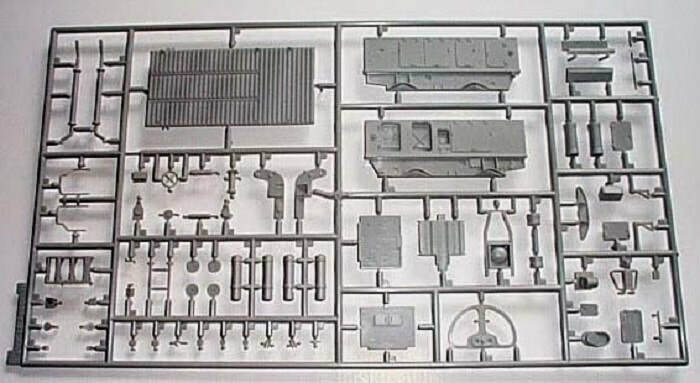 It is not the new syle of instruction sheet, recently appearing in new kits from DML, that use photos of the actual kit parts for assembly. The instructions are the old format of exploded line drawings. I have heard that a lot of armor modelers prefer this to the new style. Page one begins with a black and white copy of the box art. This is followed by the parts tree drawings. Four circular shaped parts, on the drawing of the brass PE fret, are shaded out as not to be used. I have no idea what these were originally intended to be. Every other part shown is to be used. Page 2 starts with assembly symbol translations and a listing of either Gunze Sangyo or Italeri brand paint colors to use. The rest of the page gives the first three assembly drawings. Pages 3 through 7 gives the balance of a total of 19 assembly steps. 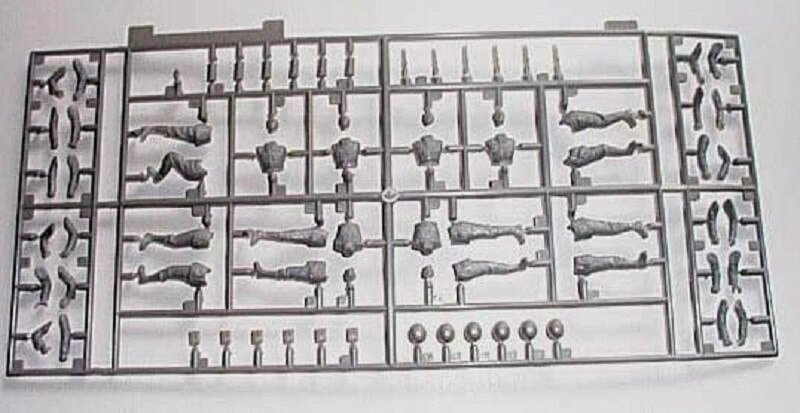 A second instruction sheet just covers the assembly of the gun crew figures. Page 8 is the paint schemes and decal placement drawings. Although there are three schemes shown, they are ALL for the "Leopold". One scheme shows it in overall field gray color, the second in overall middle stone color, and the third one with a base color of middle stone with wavy striped camouflage over it in red brown. ​Single part, letter A, is the vehicle¹s main chassis part. 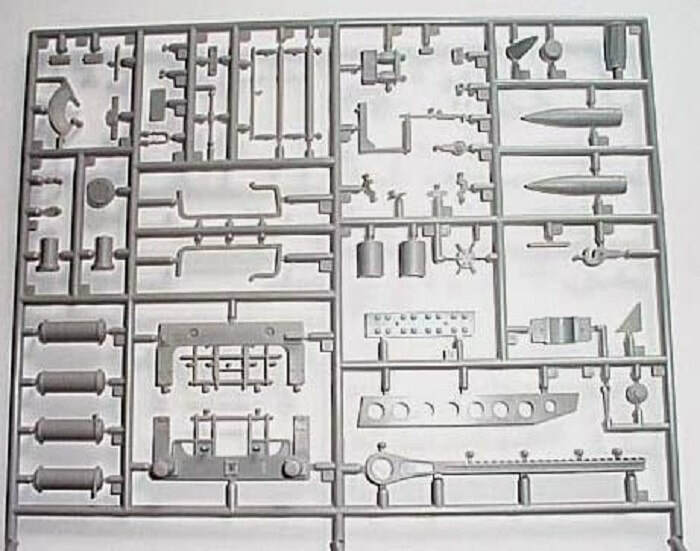 ​Letter D parts tree holds: flat car fittings, foot step for the main chassis, gun breech parts, and gun cradle parts (35 parts). 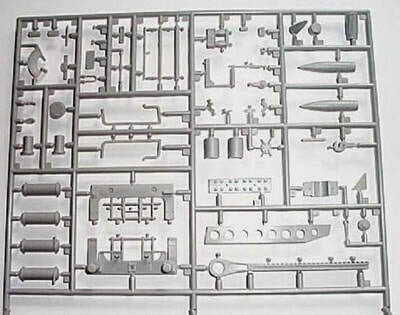 ​Letter E tree holds: Small fittings for sides of the main chassis, recoil mechanism parts, main chassis bulk-heads, ammo cradle parts, crew access ladder parts, ammo magazine parts etc. (84 parts). ​There are two identical letter G trees. They hold: ammo rounds, flat car fittings, flat car footsteps, even more recoil mechanism parts, gun pivot parts, main chassis end panels etc. (55 parts per tree). There is a second parts tree that is also labeled as G. There are four identical trees of this. They hold the flat car wheels, axles and suspension parts etc. (41 parts per tree). Believe it or not, there is a third group of parts tree called out as letter G. There are seven identical ones of these. They hold railroad ties and rails (15 parts per tree). 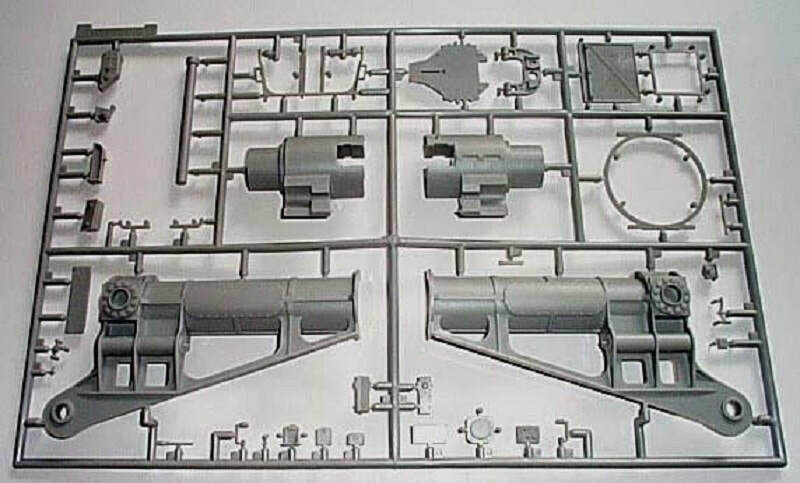 ​Letter H parts tree holds: the munitions bunker parts and ammo crane parts etc. (71 parts). ​Letter I is the rope railing string for the munitions bunker. ​Letter J is the length of metal chain for the ammo crane. ​Letter X is two railroad base end pieces. ​There are seven identical letter Y trees. They hold railroad bed center sections. (1 section per piece). ​An unlettered tree holds the parts for the six man German gun crew (73 parts). ​The decal sheet completes the contents of the kit. It is printed all in white lettering. You get the German nickname "Leopold" and whole bunch of stencil markings. However, I noticed on a black and white wartime photo in a book I have that there were more markings on this railway gun that what is supplied on the decal sheet. I wrote to Woody Vondracek, the owner of Archer Dry Transfers and sent him drawings of what is missing in these markings. He did a accurate set for this gun and credited me on the sheets for my help. 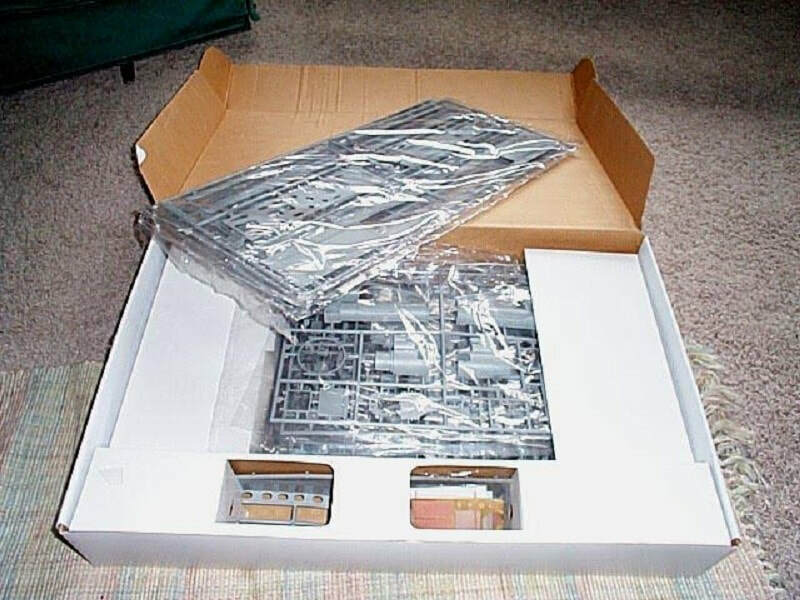 I have 2 sets of this to use when I build the model. Only problem now is that it is HUGE and I wonder where I will ever find room here to display it...sigh. I recommend this kit highly, but only to advanced armor modelers because of its size and complexity. The box art says "For modelers 10 yrs. of age on up". Yeah right!! I¹d love to see a 10 year old that talented. 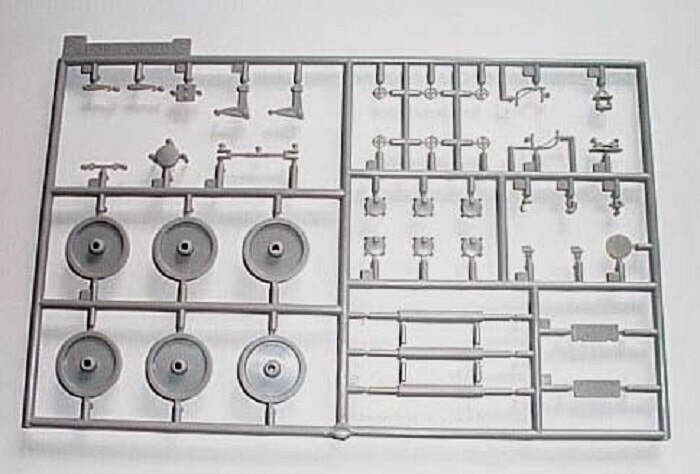 I bought my kit from GreatModels before they went out of business years ago and sold out to Sprue Bros.